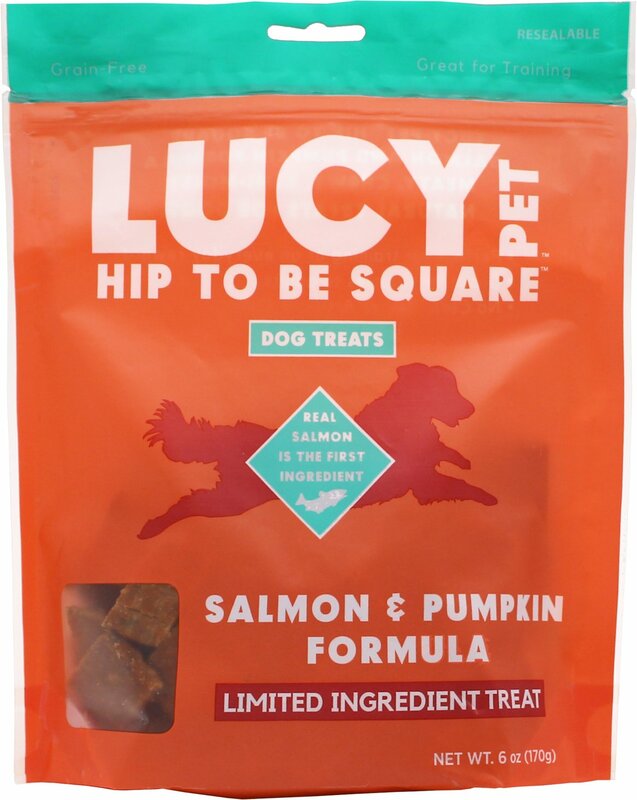 Serve up the wholesome, delectable treat your precious pooch deserves with this Hip to Be Square treat by Lucy Pet Products. 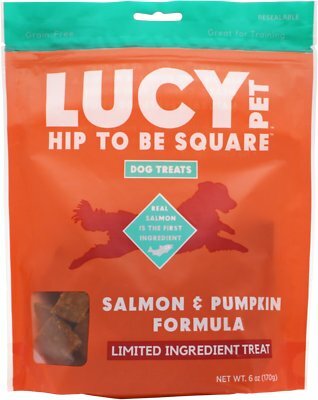 Featuring real wild Alaskan salmon and a meaty, chewy texture, this recipe is what all the cool pups are snacking on these days—and Lucy uses only real meat, too. You won't find any salmon by-products on this ingredients list! The sweet and spicy taste of pumpkin gives this treat its unique flavor, but also boosts your pal's diet with even more fiber—for a healthy, regulated digestive system. 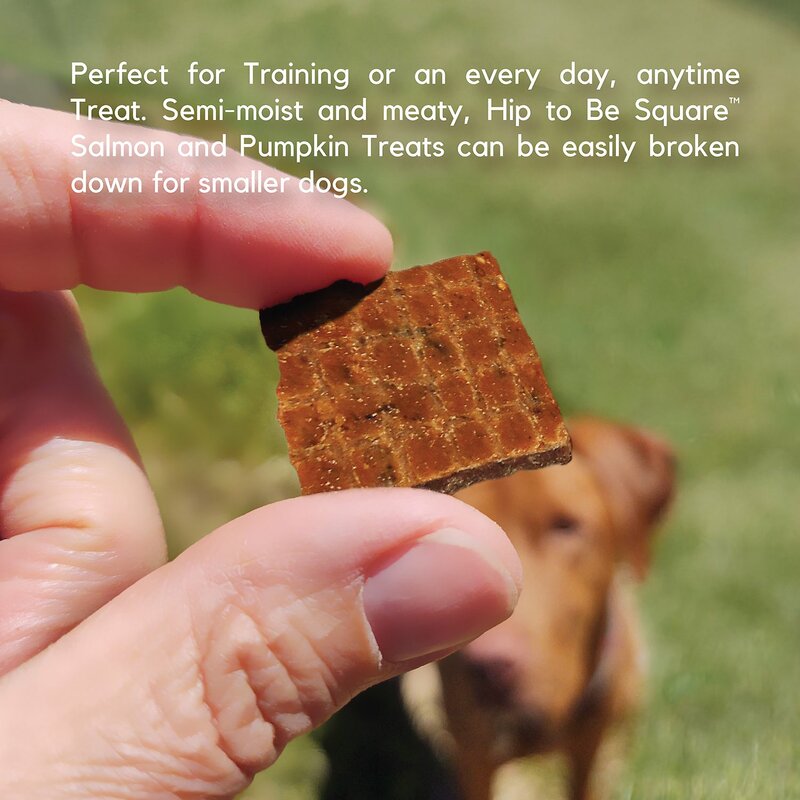 Your dog will gobble up these delectable squares without knowing he's eating something that's good for him. Plus, they're grain-free, so they're safe for pups with sensitivities to grains. It's a limited ingredient treat that doesn't limit flavor. Made without any grains or grain products, making an excellent treat for pets who have sensitivities to grain. 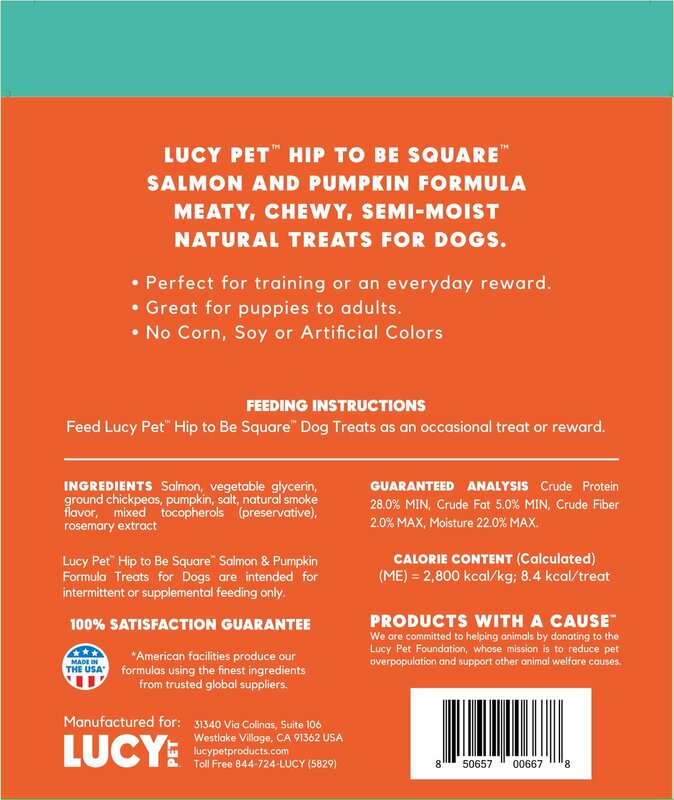 Meaty, chewy and delicious texture will be irresistible to your dog. Ideal for use during training or an everyday reward, just because. Formulated for all lifestyles—from puppy to senior—so your dog never has to give up his favorite snack. 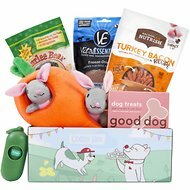 Every purchase helps animals in need by contributing to the Lucy Pet Foundation, so you can feel great feeding your pal and helping others who need a paw. Salmon, Vegetable Glycerin, Ground Chickpeas, Pumpkin, Salt, Natural Smoke Flavor, Mixed Tocopherols (Preservative), Rosemary Extract.